Unless I'm really blind, something has changed, or I'm doing something wrong, The menu item for Insert SuperStar Effects is gone. Testing this on my Windows XP desktop. I'll try the Windows 7 laptop once I get onto my train going home. I just tested - it is the same as 5.0.4. This happens to have been grabbing the 12 strings of my pixel tree, but I get exactly the same response with a single channel, a single RGB channel, a group (one string of the tree for example), or if a create a group that has all 12 strings in one group. I confirmed the same thing on the Windows 7 laptop this morning as well as this screen capture from the XP desktop. Also getting the same thing in 5.0.4 which is one of the reasons that I admit that it must be me - I HAVE gotten it to work in 5.0.4 right after that version came out. Obviously my total lack of PE experience is showing here. In a real quick test, the only way I can make this happen is if I pick props that are NOT RGB. It shows exactly the same thing, ie missing the "Insert Superstar Effect". In all other props that are setup in PE to be RGB it works fine. Is it possible that these props are not setup properly. ie Network, channels, rgb etc...? I am still having issues setting up some props but for the most part I got them to work. Also, the Insert Superstar Effect mode is quite a bit more stable in the latest version, however it is different from what we are used to, as far using Superstar. This is an example of how one leg of my tree is setup in Prop Definition. If you already know this pls disregard. The preview I'm using was an import of a visualization file. Out of almost 6K channels, there are only about a dozen channels that are NOT RGB - everything else is RGB. I just opened the Preview Editor and confirmed that every prop that should be RGB, is so. Every white light shows as a traditional white light on a single channel. I had the same problem and reported on 5.0.2. I got it to work in 5.0.6 but don't remember all the gyrations I had to go through to get everything lined up so it would work right. I am going back to recreate what I did and then will post it if you still want it. 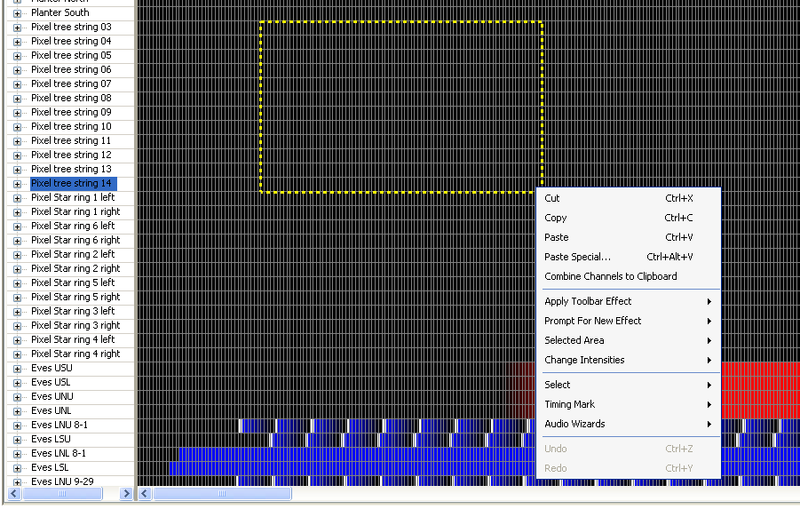 I had only limited luck in getting an import of visualization to work properly in the new Preview. I ended up rebuilding the props in PE (Sequencer) to work the way I wanted. ie The import did not always arrange the props (legs) in relation to the way the prop was actually built. I rebuilt each prop one at a time to make sure it worked, then added them to a new Preview. In doing this I was able to see any difference between the import and what PE needed to work with that prop. If you want I am tinkering today with LOR and if you want to send your .lee file I can look into it and see what I can. The .lee file would be the best because it contains the network, channels, unit id's, info, etc. of what you actually have. This helps in setting up how it needs be in PE. Star Effect" to appear as a menu choice. I then did an "Append Prop" to add in the Prop from the Preview that I built. 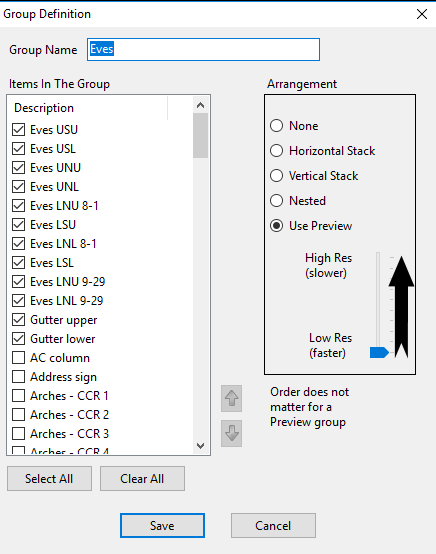 Once you do that you can open the prop in the View and you will see that the effects that were in the individual channels that were converted are also in the Prop from the Preview. I tested this on a Matrix that I have over my garage. 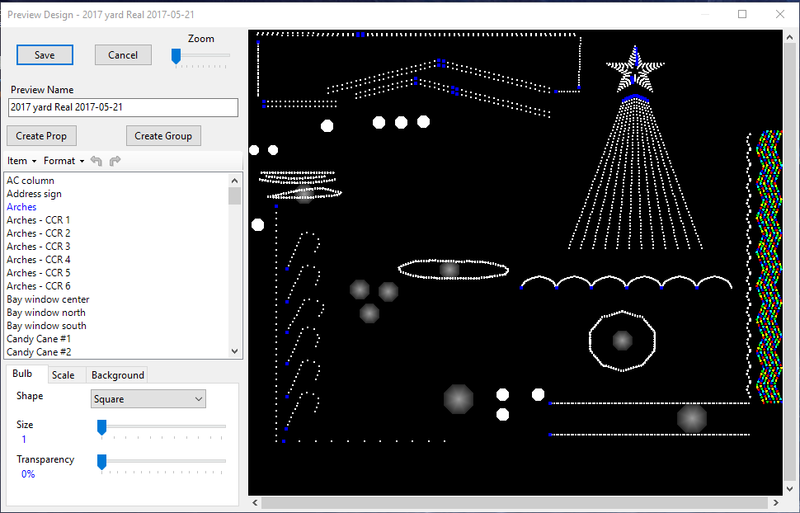 In visualizer they were grouped by controller and named CCP 1-2, CCP 3-4, CCP 5-6, CCP 7-8, CCP 9-10, CCP 11-12 and CCP 13-14. These all came over with the open against my new Preview just like this but I could not get to SuperStar. 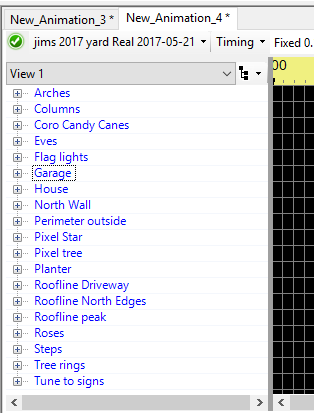 I did an "Append Prop" and selected the "Garage Matrix". When it added to the View I opened it and then opened the Garage Matrix Channels under it. Wala, all my effects were there so I could either Hide or Delete the CCP 1-14 that were pulled in. I Hide mine because if you want to create something in native SS, export to an .lms like under S4, you can copy and paste into that old format. I hope I didn't confuse things to much. I Imported your .lee file into Preview and saved it as jims 2017 yard Real 2017-05-21. I was able to Insert Superstar Effect with no problem. I'm still looking at it and playing with it, but it seems to work ok. This is with ver 5.06 Pro running on a win 10 box. As a side note, one thing I did see (has really nothing to do with this issue) is when (if your pc can handle it) you create a Group prop for Preview be sure to slide the slider to High Res, it will make your prop look better on playback. Not at all required, but it does make it a better representation of your prop during playback. Non-matrix type things are mangled even worse. Note that this is a screen capture from 5.0.2, but it's exactly the same in 5.0.6. I discovered that when I created the new sequence using my preview, there was a group called everything. I tried highlighting that and using that to Insert SuperStar Effects. That made the screen capture above look really good by comparison. 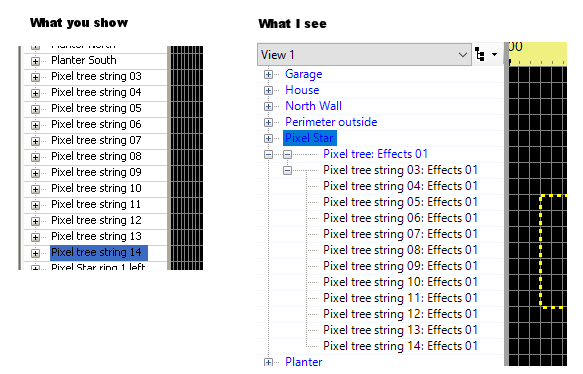 Next test was to copy my existing preview and then add a 16 x 50 matrix to it. Then changed the Preview for my newly created sequence to the copied version, append props to add the matrix, and try to Insert SuperStar effects on the newly added matrix. 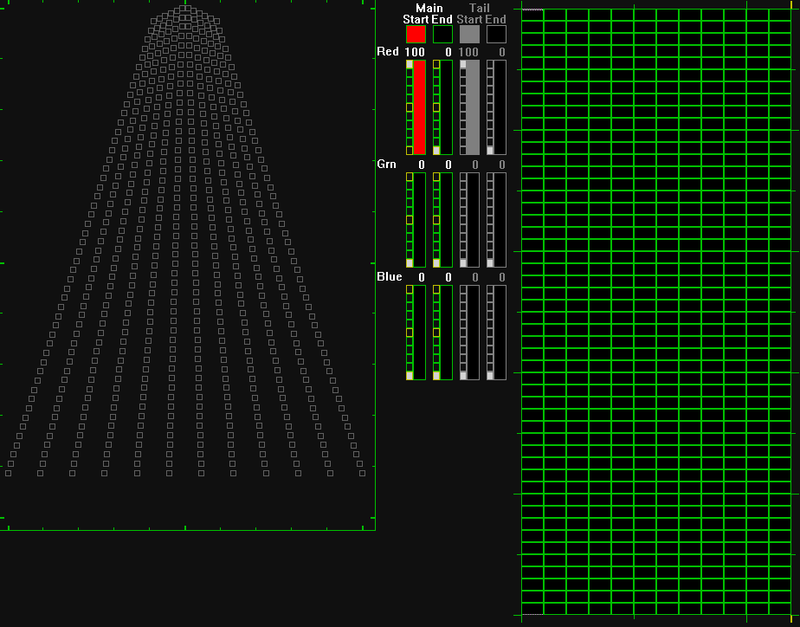 That displayed correctly in SuperStar, and exported back to Sequencer correctly. 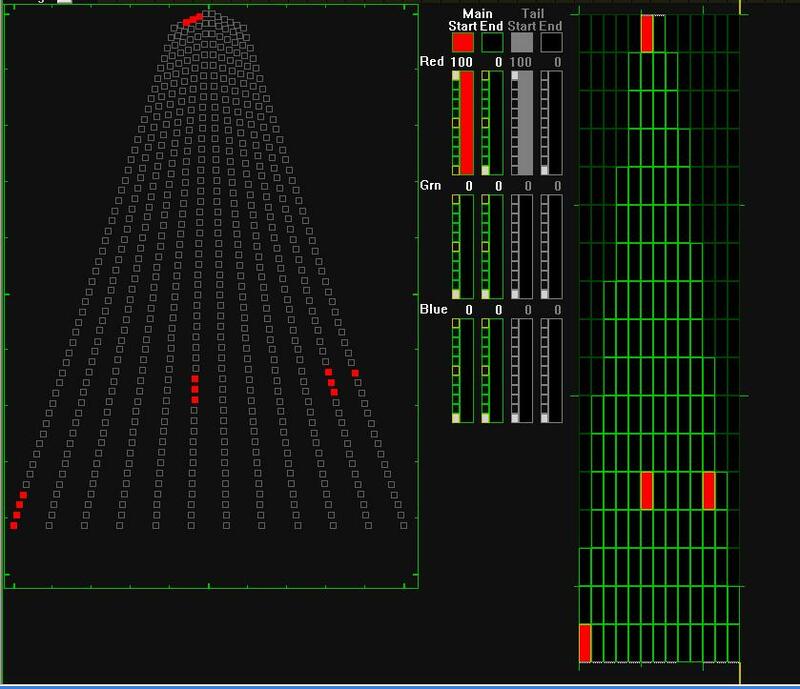 So what it appears to me is that the ability to import a Visualization into the S5 Sequencer is a worthless piece of crap and you really will need to waste your time and completely rebuild it from scratch or else it won't work right. Even doing that, the ability to use SuperStar is EXTREMELY limited in S5. I pray that by the time that the beta test is completed, the SuperStar integration becomes useful - at this point, for someone who does ALL their sequencing in SuperStar, it is not.. This is a 2 part message. I had already had the below message ready to go, but your latest message showed up before I could send it. So I'll start with the latest first. This is what I see using the steps below when Inserting a Superstar Effect into the .lee file you sent me. It appears to me as a grid. Try the below steps and see what happens. Below is a message I had already typed up, but your message appeared before I could send it. It still has good info so I will send it anyway. This is odd and I don't understand why it is this way. In the pic below, your view and what you sent me are 2 different things. Is it possible you were viewing another Preview? when you snapped your pic. Try these steps to be sure we are on the same page. 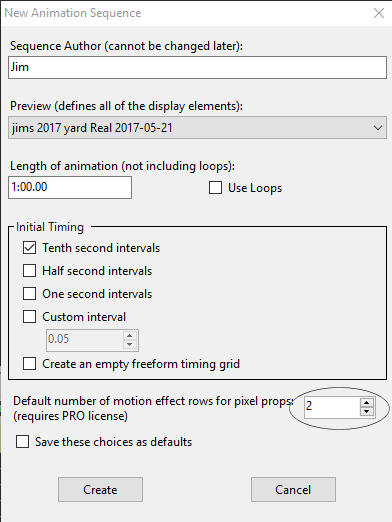 Create a new Animation sequence using the 2017 yard Real 2017-05-21.lee as the Preview, be sure to click at least 2 in the Default effect rows. This very handy to overlay SS effects with SE effects or 2 SE effects overlayed on top of each other. After you create the Animation Sequence it should appear and look like this. If not let me know. At this point you should be able to highlight the row in which you want to put a SS effect in, right click it and it should appear. If not let me know. As I said in the end of my message. If I create a NEW sequence, the preview works, but if I open an existing .las or .lms file it does not work. So, you either get to scrap your visualizations and rebuiild them manually in Preview Editor or scrap your years of sequencing, but you get to use an existing visualization turned into a preview. And even then, you still have only VERY limited SuperStar capability. 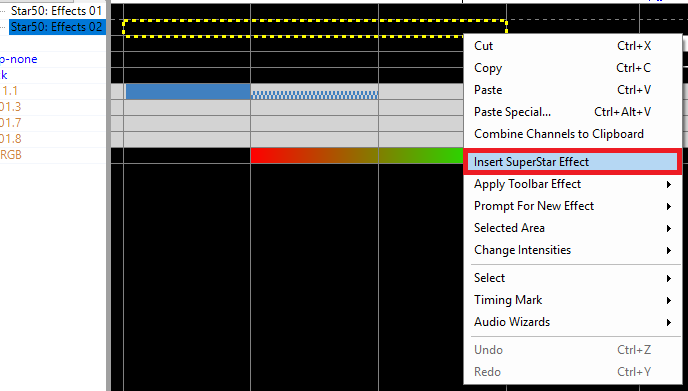 Now, it does appear that you can skip Sequencer all together and directly open an existing .sup file in S5 SuperStar (or create a new one) and edit, save, and export just as we could in S4. The only limitation is that there is no way to update the configuration since Visualizer no longer exists and there does not seem to be any way to export a preview into SuperStar to setup the configuration. 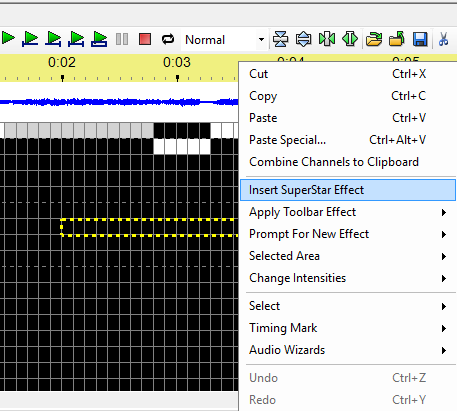 It would appear that you could also export a file from SuperStar in legacy format and then open that into Sequencer and then add some PE effects. The biggest issue with that is that it's a one way process. 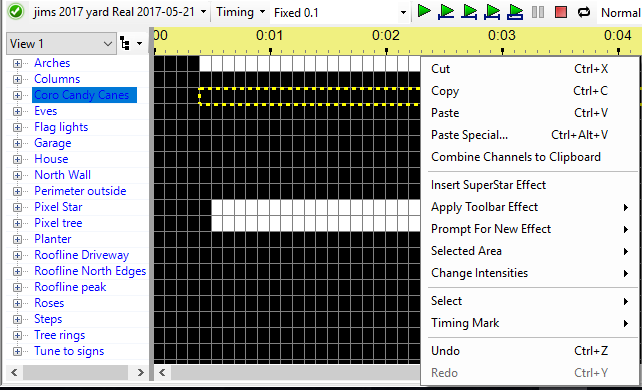 If you need to add or change something into your SuperStar sequence and re-export it, you would then have to re-do whatever work had done in Sequencer. To your last point I am keeping a computer with S4 and will maintain my Visualization and SS sequences in it and then copy them over to S5 to open and Copy and Paste into my S5 sequences until they get this integration fixed. All of my RGB stuff is in SS and this is the only way I can think of to minimize the frustrations. RCS, completely agree! My show computer, the server (which runs the show during most of the year except Christmas season), and my desktop where I do most of my sequencing, is all 4.3.24. I have no plans to move the show to S5 this year. I am actively playing with the S5 beta on two other computers. Even ran the landscape show for one evening for a test a few weeks ago.